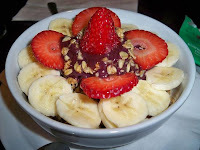 Fooditka: Rio's Mania - Mad about Acai! Rio's Mania - Mad about Acai! Sooz and I got invited to visit Rio's Mania, a relative newcomer to 28th avenue. It's a Brazilian spot that's different from the stereotypical churrascarias, that Brazilian fare is known for. Instead, Rio's offers light and healthy options at even lighter prices. 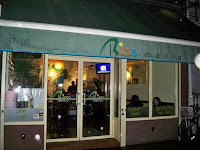 Rio's is a small place with modern, cheery decor. Their awning is nice and new looking, peaking your curiosity to see what lies beneath the surface. Once you go inside, the space is intimate yet uncluttered and uplifting. There's a mural in the back of the room, depicting an inviting beach in Rio. There's a counter up front where you could order for takeaway or you could get table service. Most of the tables are wooden and simple but there are a couple of cushiony chairs in the front where you could really unwind. 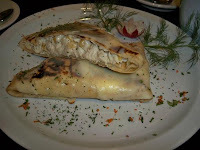 Chicken, Catupiry Cheese, Corn and Hearts of Palm Crepe - I was drawn to this crepe because of the cheese, which Sooz said was light as well as for the chicken-corn combination, which I love. Happy with what came on my plate, it was a manageable portion that still filled me up. The chicken, corn and hearts of palm were a lovely filling for the paper thin crepe, which was wrapped in the cheese like a little package. It didn't come with an unnecessary side of fries or other starches. Instead it was served with a beautifully cut radish, which I devoured. X-Tudo - Sooz explained that the meaning of "x-tudo" is "everything" and that described her dish quite well. 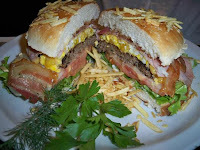 It included everything under the sun such as hamburger meat, ham, cheese, egg, bacon, corn, lettuce tomatoes and mayo. She kept saying how light it was, which I found unbelievable until I tried it. Despite its all-encompassing look, this sandwich was light, which could be attributed to the delicious hamburger meat. It was thin yet so flavorful, leaving you with a pleasant feeling without weighing you down. The bun was sprinkled with French fry potato chips, which added a nice crunch. I'd definitely order this the next time around. Acai Traditional - We were talked into this dessert by the restaurant's owner Fred. At first I was skeptical but after he described that it would be topped with fresh strawberries, bananas and granola, I was so in. After I took one bite, I was hooked. The acai tasted like delicious blueberry sorbet. It was sweet but not overly so and was just so refreshing. I could see getting it after a good workout and I'd love to come back and have more, especially in the summer where it could serve as a healthy alternative to ice cream. Our servers were wonderful, attentive and knowledgeable. They weren't afraid to make suggestions and I'm so glad that they talked us into trying acai. Overall, everything about the service was spot-on--timing, personality and accuracy. It was all good and you could tell that the people there really love their jobs. Rio's is inexpensive and you'll get great bank for your buck. All savory crepes are $6.50 while the sweet ones are $7. Salads and sandwiches range between $3.75 and $7.50 while smoothies are all $4.50. Our acai was $6 for a very large bowl - so worth the price. did the phone number for this restaurant change? I tried calling them too - they might've gone out of business. I'll investigate further.